Hi guys just like the title says... I'll entertain new or used. If you have another sub you have had great experience with that you are selling I will look at those too! I have a R-115 SW that has barely been used I'd sell for $450. No shipping though. Also pretty sure Fry's won't ship the sub they are running on the daily deal. Where are you located? 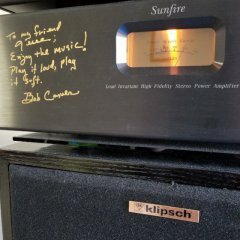 I have 2 Klipsch R-115SW's for sale both pretty much mint and fairly new. Thanks everyone just ordered the 15 from Fry's with free shipping! oh that's awesome I didn't think they'd ship on the special price. Very good sir. The Fry's deal includes a free WA-2 wireless Sub Kit. Don't forget pick one up or ask salesman. Are these still for sale? Are you willing to ship? Thanks. .hanks everyone just ordered the 15 from Fry's with free shipping! Curious as to how you were able to get the sub with shipping. Did you call Frys? Yeah I'm not too sure it must have something to do with how I'm local to the store. I've checked out with Fry's before with them not giving me a shipping option and vice versa so when I saw a free local shipping I hopped on it! Definitely check it out if you're local to one. They are still available but the price to ship them would really take like half my profit. I learned my lesson shipping item's this big and heavy. Sorry, I'm only gonna sell local.